This Saturday sees the return of Amir Khan, following his 39 second blowout of the shell-shocked Phil Lo Greco at the Echo Arena, Liverpool back in April. 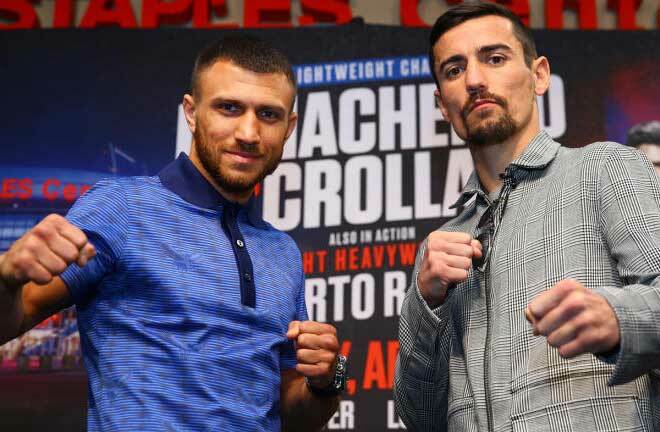 He is again eased along this weekend at Arena Birmingham (formerly the National Indoor Arena) when he meets the limited Samuel Vargas over twelve rounds in the Second City. Vargas is ranked at number 10 by the WBA, but as we have recently seen with their latest Heavyweight rankings, this doesn’t count for an awful lot. Sky Sports is the place to see the action unfold. Here I preview the main event. 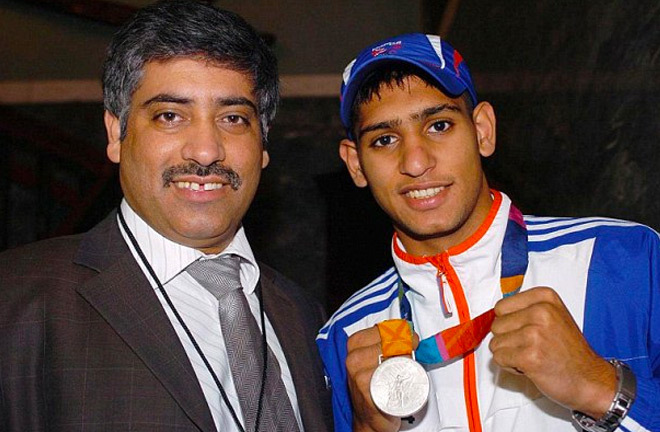 Amir Khan with his father, Shah, showing off his Silver Olympic Medal in 2004. Khan was a precocious amateur, and was only denied Olympic Gold in Athens in 2004 by the outstanding Cuban great, Mario Kindelan. Khan would have to settle for Silver. Before turning professional, Khan defeated Kindelan in his last amateur bout, leading a scramble for his signature. This was won by Frank Warren, and Khan duly turned pro in his hometown of Bolton in July 2005. David Bailey was to be the opponent, and a spectacular one round stoppage ensued to announce Khan’s arrival. Eleven straight wins followed over the usual learning and limited opposition before he met Willie Limond for the Commonwealth Lightweight Title in July 2007. 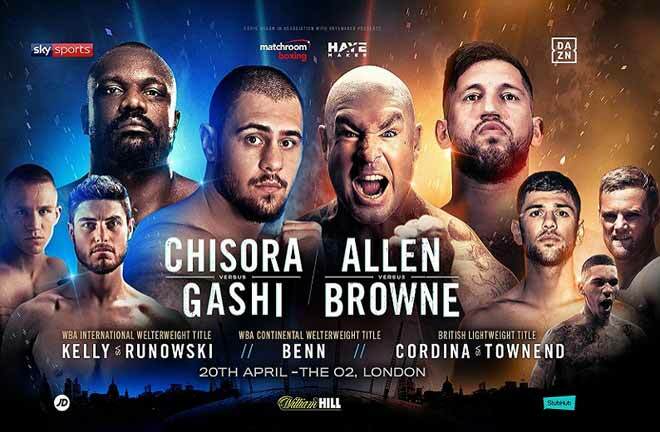 The O2 Arena, London was to be the venue. It was in this fight that Khan first showed his future Achilles heel and vulnerabilities. The usually light punching Scot floored Khan in the sixth round, and the Bolton man seemed to be the recipient of a generous count from referee Marcus McDonnell. Khan recovered in the seventh to score a knockdown of his own, eventually forcing Limond’s corner to throw the towel in with Willie suffering a broken jaw. Three defences of the belt (Scot Lawton, TKO4, Graham Earl, TKO1, Gairy St Clair, Unanimous decision) followed, as well as a seventh round stoppage win over Martin Kristjansen to pick up a WBO Intercontinental belt. Khan then met Mancunian Wildman Michael Gomez in Birmingham. Gomez was considered a shot fighter, but after being floored in the opener, he decked Khan in the following round. After a wild scrap, Khan recovered to drop Gomez with a body shot in round five and forcing the stoppage shortly after. The warning signs were there for all to see, but Khan joined up with new trainer Oscar Rubio, who mistakenly identified little known Columbian banger, Breidis Prescott as Khan’s next opponent. Prescott proved to be Khan’s worst nightmare, ruining the Bolton man inside a round with a savage knockout win. 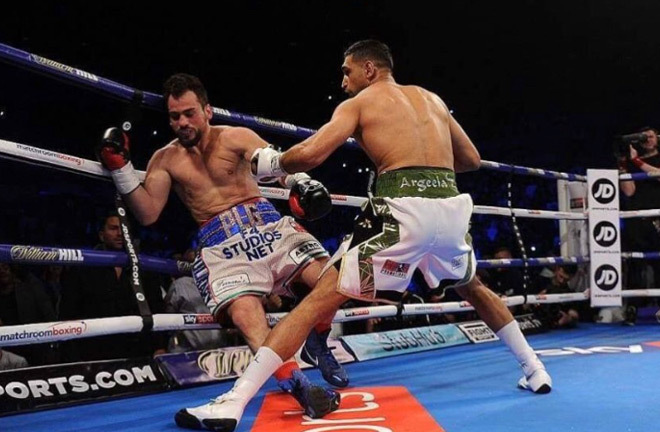 Khan was forced to rebuild, this time under the tutelage of legendary trainer, Freddie Roach, and duly stopped the limited Oisin Fagan in two rounds. Khan’s promotors took another risk, this time one that paid off in landing Marco Antonio Barrera in Manchester in March 2009. Khan ran rings around the Mexican legend for five rounds, until the contest was forced to a halt due to a horrendous Barrera cut. Khan triumphed widely on the cards. This opened the doors to World level, and Khan gobbled up the opportunity, dethroning Andriy Kotelnik on points in a hard fought scrap in Manchester, to lift the WBA Super Lightweight Title. 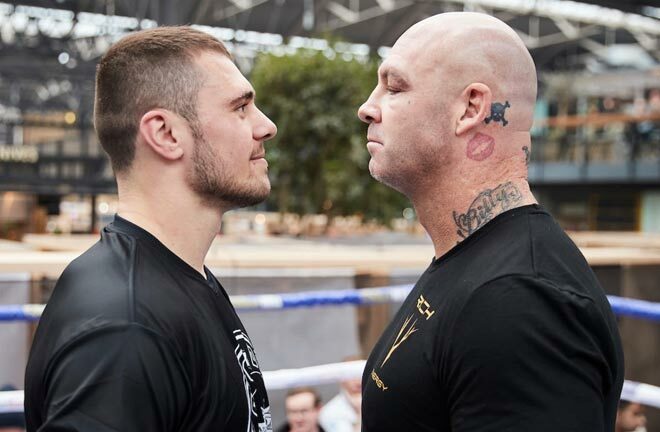 He then stopped the hapless Dmitry Salita inside a round, before making his US debut in New York, thoroughly outclassing Paulie Malignaggi, before stopping him in eleven. 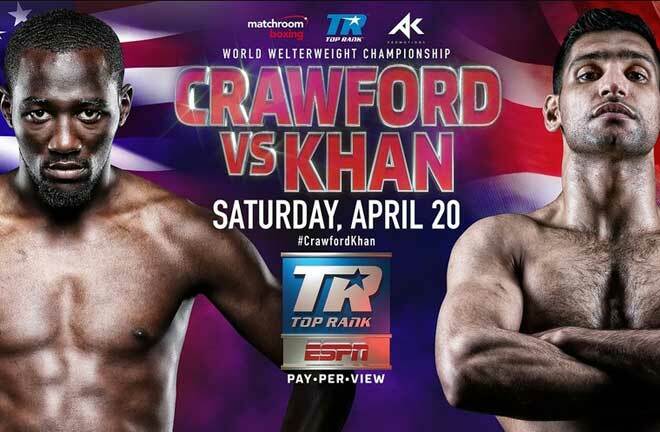 Next up was a Vegas debut, and a real gut check for the ever improving Khan. He met Marcos Maidana at the Mandalay Bay in an absolute classic. Khan dominated the fight early and knocked down Maidana in the 1st round with multiple body shots. However, Maidana recovered and battered Khan to the brink with a furious assault in the tenth, sending him wobbling toward the ropes. Khan managed to ride out the storm in a fight of the year for Boxing Writers Association of America. Khan returned to Manchester to easily beat Irishman Paul McCloskey (Technical Decision, head clash after six rounds) and went back to New York to add the IBF Title to his WBA strap by knocking out Zab Judah in five. Khan was on the crest of a wave, but was bought back down to earth in a bizarre contest with Lamont Peterson in December 2011. After knocking down Peterson in the opener, Khan was deducted points in rounds seven and twelve for “pushing”. Khan was to lose by split decision in a fight he looked to have won. It is more remembered for a mystery man in a hat, later identified as Mustafa Ameen. He was affiliated with the IBF and had a credential arranged by the IBF as a courtesy, but was not at the fight in an official capacity. However, he was seen on video at ringside apparently touching the scoring slips, which is against the rules, and distracting a judge. He was also seen in the ring apparently celebrating with the Peterson team after the fight. A rematch was arranged, but then scrapped in 2012 after a Peterson failed drugs test. Khan came back seven months later to challenge for the WBC belt, but after a bright start, was derailed and stopped in four by Danny Garcia. His career now lay at the crossroads. He again changed trainers, this time to Virgil Hunter, and defeated Carlos Molina via tenth round retirement on his comeback. In another return to the UK, this time in Sheffield, Khan squeaked past Julio Diaz on the cards after being knocked down in the fourth. This prompted a move to Welterweight, and he impressed in thrashing Luis Collazo in Vegas on his debut at the weight. He backed this up with solid, wide points wins over Devon Alexander and Chris Algieri. He would then receive an opportunity to fight for the WBC Middleweight Title against Saul “Canelo” Alvarez. He would weigh a career high 155lbs for the contest in Las Vegas. Khan was well in the contest, ahead on one card going into the sixth, when he was flattened by a wrecking ball of a right hand which crumpled the Boltonian on impact, knocking him out cold. Khan announced his return against Phil Le Greco with a 1st Round KO. After a near two year hiatus, Khan returned to action in Liverpool in April this year, where he bulldozed Phil Lo Greco inside a minute, which proved little as to what he has left in the tank at 31 years of age. His opponent on Saturday night in Birmingham will be the Canadian based Columbian, Samuel Vargas. He is much along the same form lines as Lo Greco. Three defeats and two draws are on the Vargas slate since he turned professional in Montreal in February 2010. Notably they are all when making the step up. After a majority draw in his eighth bout against Tebor Brosch, he surrendered his unbeaten record in December 2013, dropping a points decision to Pablo Munguia, in his opponent’s Mexico City back yard. Vargas rebuilt with five straight wins, but was then derailed by Welterweight starlet, Errol Spence Junior in April 2015, stopped in four rounds. 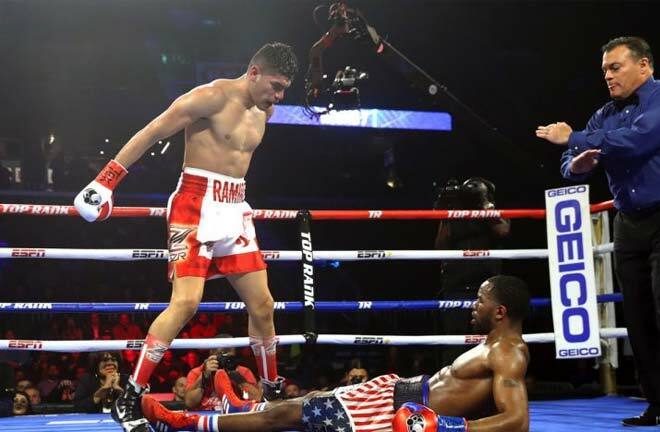 Another drop in level and five comeback wins followed before Danny Garcia stopped Vargas in seven rounds in Philadelphia at the back end of 2016. Since then Vargas’ form hasn’t really been eye catching. He squeezed past the ageing former Lightweight World Title challenger, Ali Funeka (majority decision) in August last year, and in his last contest, in June, Mauro Godoy of Argentina held him to a majority draw in Canada, so the omens don’t look good for his meeting with “King” Khan this weekend. 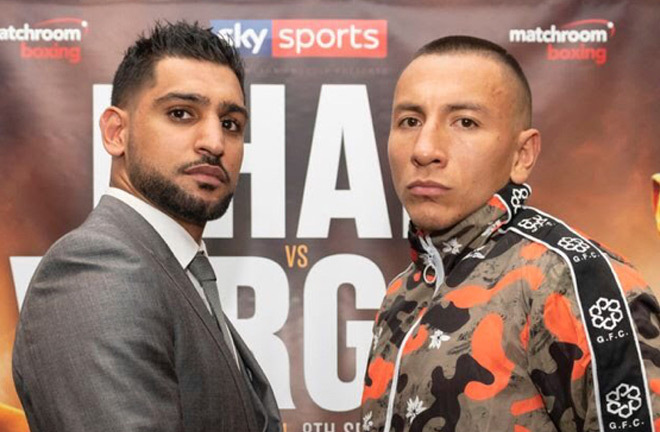 Khan vs Vargas is the main event this Saturday. Catch the action live on Sky Sports in the UK. All roads lead to a World Title shot, or the much discussed Kell Brook fight for Khan, and I don’t envisage Khan having to overcome many rocky moments against the limited Vargas, especially as Vargas holds an under 50% knockout rate. I see Khan winning this comfortably before half way, with the punch accumulation surely proving too much for Vargas.